Congratulations go to Hastings Borough Council for daring to be different. 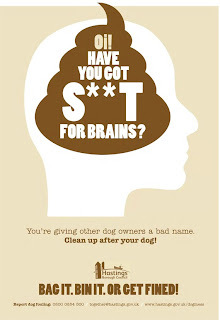 Having become increasingly frustrated at people's attitudes to dog fouling on the streets and payments of their historic town, the Council decided to do something about it. And, unusually in the 'scared to offend anyone public sector' they challenged a local agency to come up with something a little different to get their message across. The ensuing tag line of "Bag it. Bin it. Or get fined" is itself nothing out of the ordinary but the execution, across posters and car stickers, is rather striking - and as you can see gets the message across right between the eyes. The strategy by nature of its approach was bound to offend some in the town but as we have said before - bland creative will go unnoticed, good creative will get people talking. The full story and other s**t executions can be found here.